So much for two blog posts a week, huh? Well in my defense I HAVE been productive these last few weeks – i’ve also been stressed and worried like crazy about getting things finished on time. Overall it hasn’t been too much fun. But at least I have something to show for my efforts, and I would like to share it with you guys. 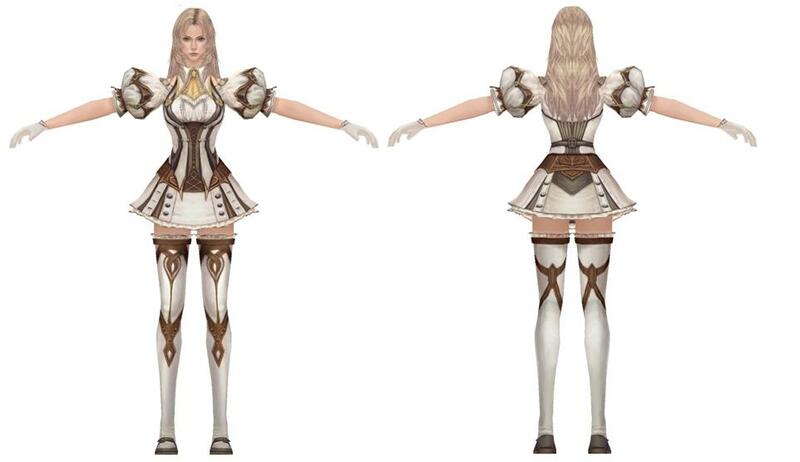 This costume is a female Fighter from Granado Espada. Wearing the Ivory School Look. I saw this design ages ago and fell in love. 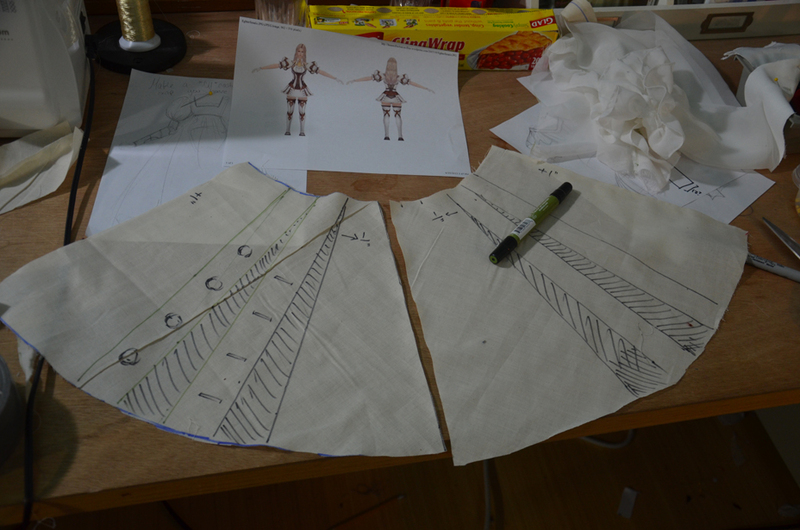 Sometime last month I decided I wanted to create for Otakon and began work immediately. But things went very poorly and I lost all confidence in the costume…it wasn’t until last week that I felt a burst of energy and resumed work on it. Getting it from 30% to 95% in five days. This is easily the most complicated project I have ever done – it wasn’t difficult, but it was very tedious and more challenging then I had expected. Overall it was really messy to make and I didn’t take very many photos. Because of that this post will be quite vague and far less detailed then my past “the making of” projects, sorry! I started out with a sketch. 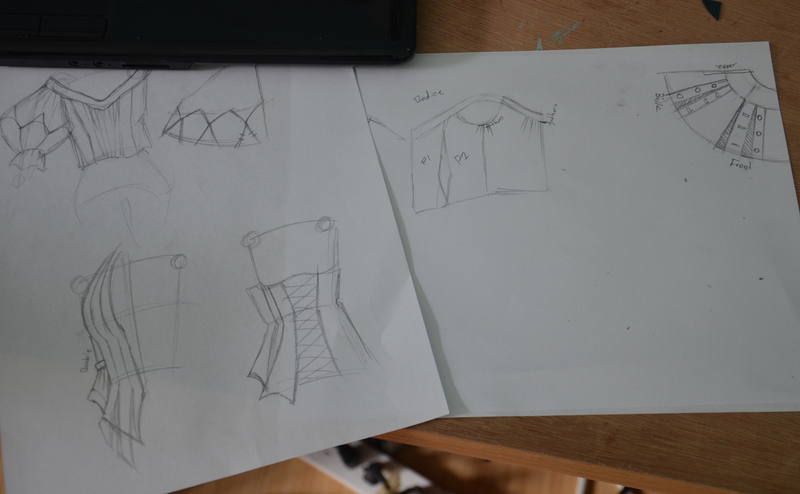 Since this costume has a lot of pieces (skirt, undershirt, collar, tie, vest, corset, and socks) that layer atop each other, I had to do quite a bit of planning out. 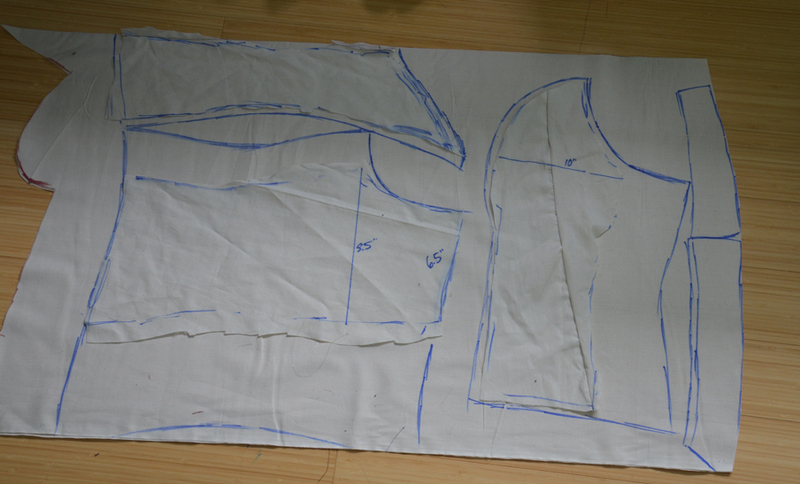 I decided to start by drafting the undershirt, since it was the lowest layer. 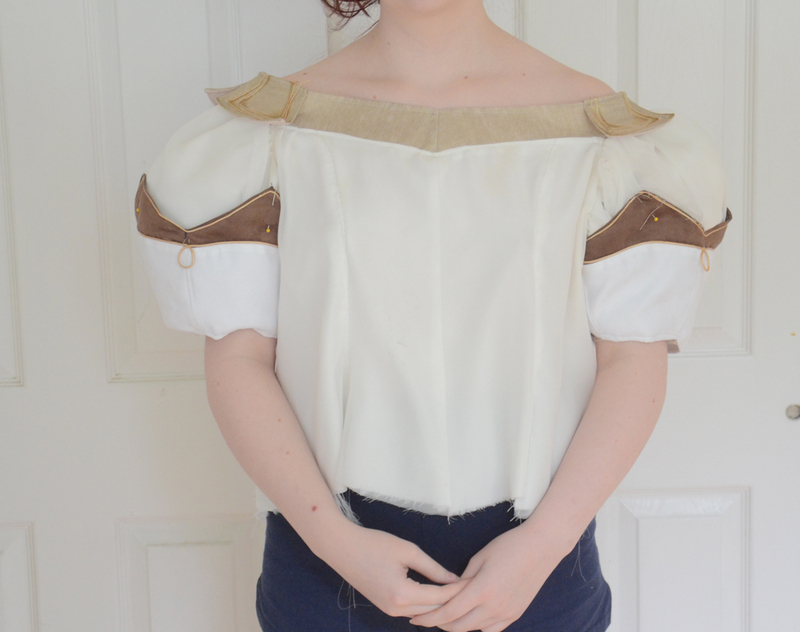 I wanted it to be super loose and gathered, like a tunic. This way it could be pullover without any sort of closure and super comfy. 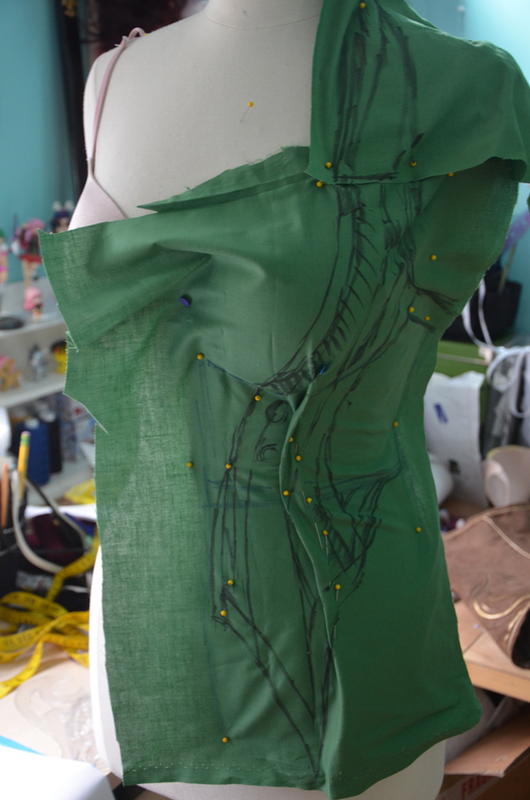 I draped it on my dressform, then added several inches to each piece so it would be loose. Then I turned that into a mock up, which didn’t go too well,. I don’t have photos of it, but it was pretty awful. The second attempt looked MUCH better! The real one was made from satin with an overlay of off-white chiffon. The neckline was made from a lovely light gold stretch knit, which was lined with non-stretch satin so it would hold the shape. The sleeve covers are made from suede. 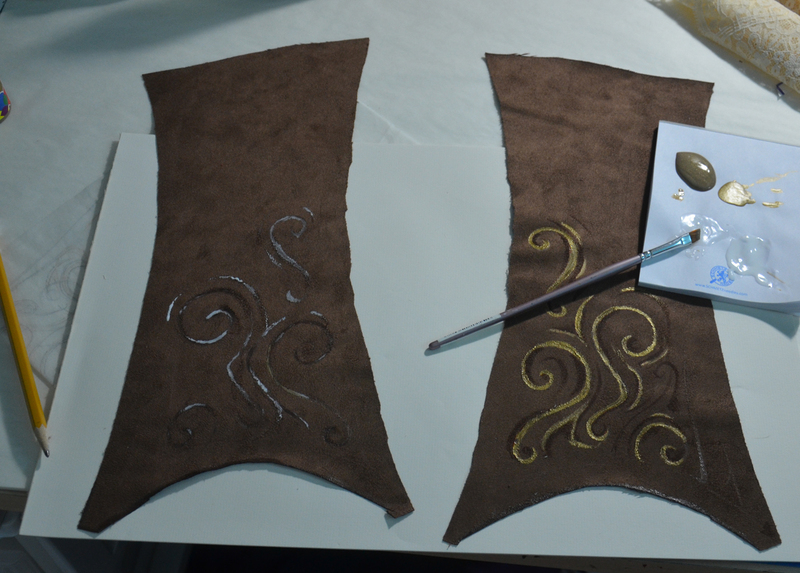 Each one is decorated with 1 and 2 mm gold leather cording. This stuff was a huge pain to sew on but I really love it! Each sleeve is stuffed with cotton fluff. Attached to the neckline I have six little tabs, each one is edged in 1mm cord and shaded with ink to give them more depth. And that was that! 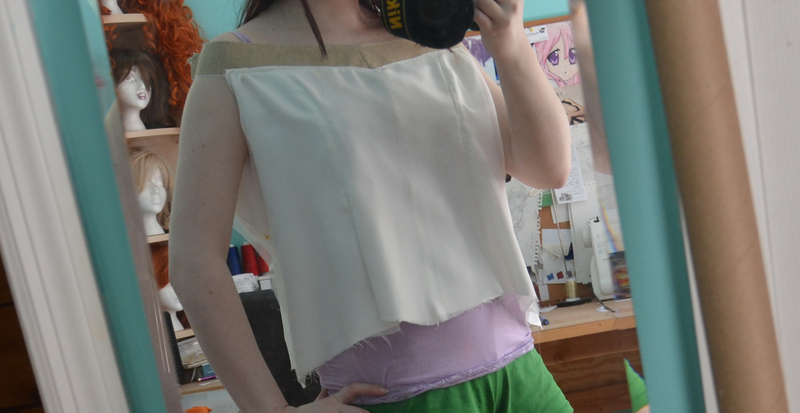 Later on it got hemmed and I added a ruffle, but nothing too exciting. 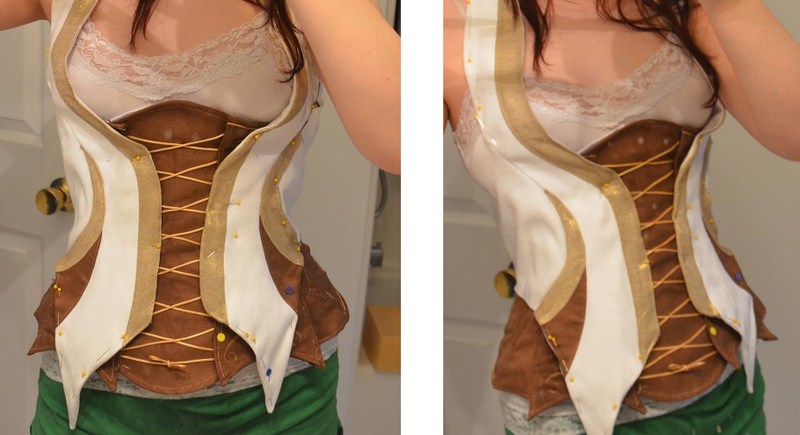 Moving onto the fake fronted corset. 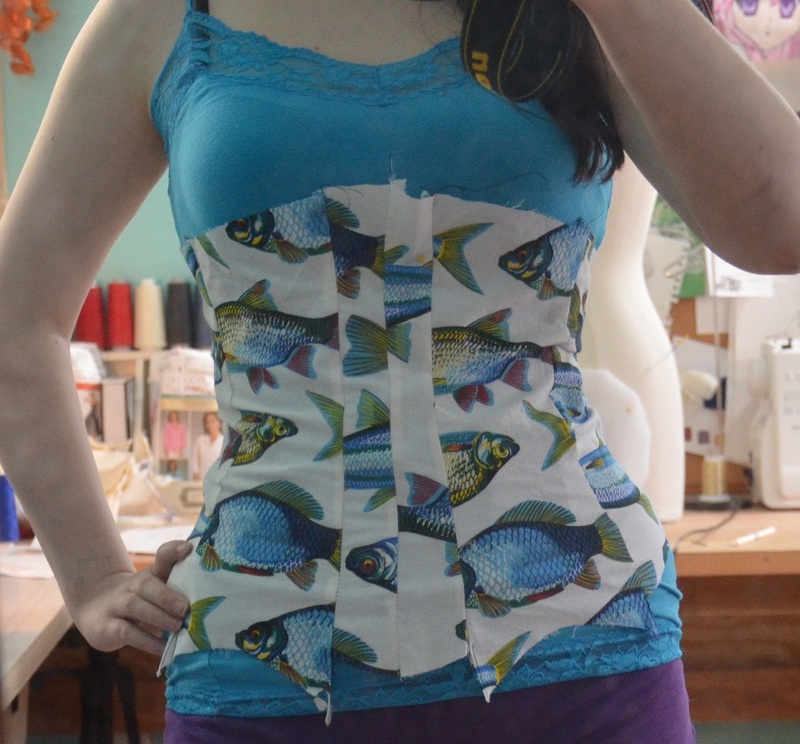 I took my measurements and flat drafted this the same way I did my RMT corset. 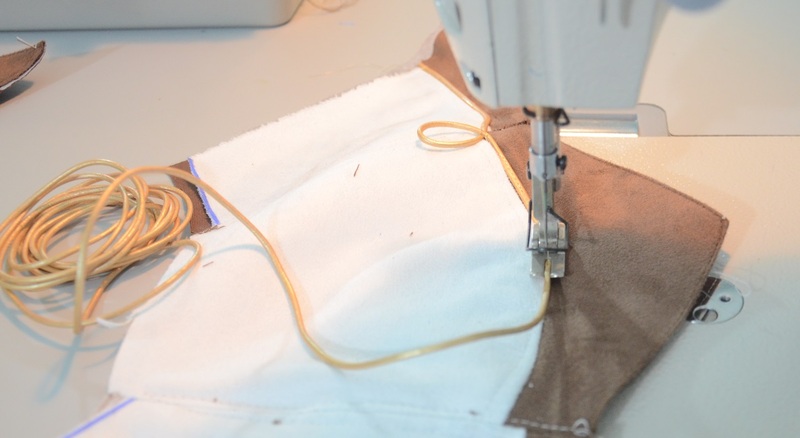 I thought a lot about closures – originally I wanted lacing, then I though a zipper would work better. I ended up going with snaps, but for my mockup I used a zipper. It fit perfectly so I turned it into a pattern and cut it from heavy, fake suede. 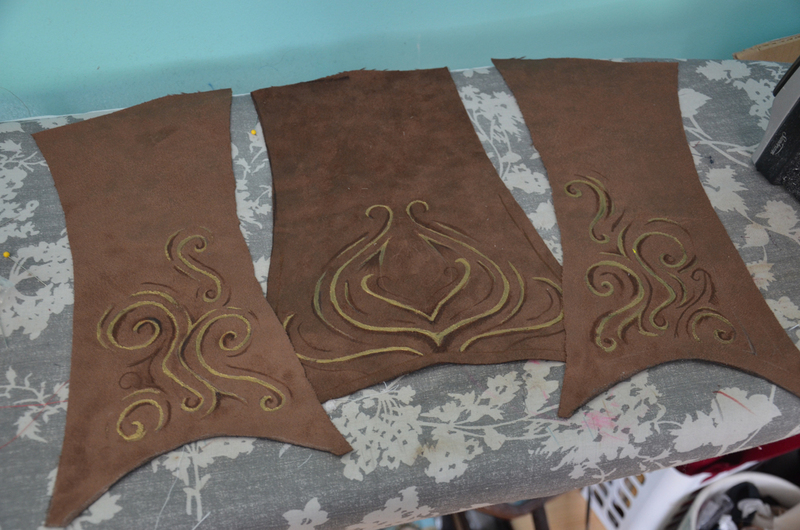 The front and back panels all have golden detailing on them, which I wasn’t sure how to recreate. 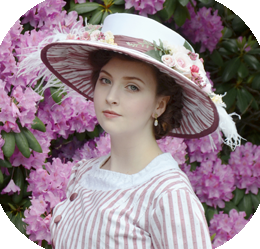 I thought about embroidery, but my skills in that area are quite tragic – so I decided to paint them on. I used a marker to sketch out the design, then I went over it with tacky glue, and lastly several layers of gold paint. They really lacked depth, so I went in with copic markers to create shadows and such. 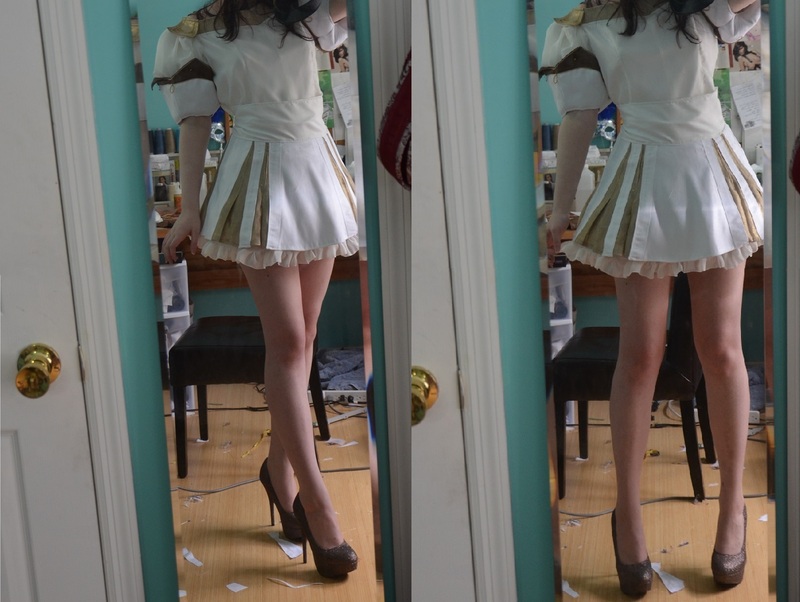 Still needs some work, but that will come later, it’s time to talk about the skirt. 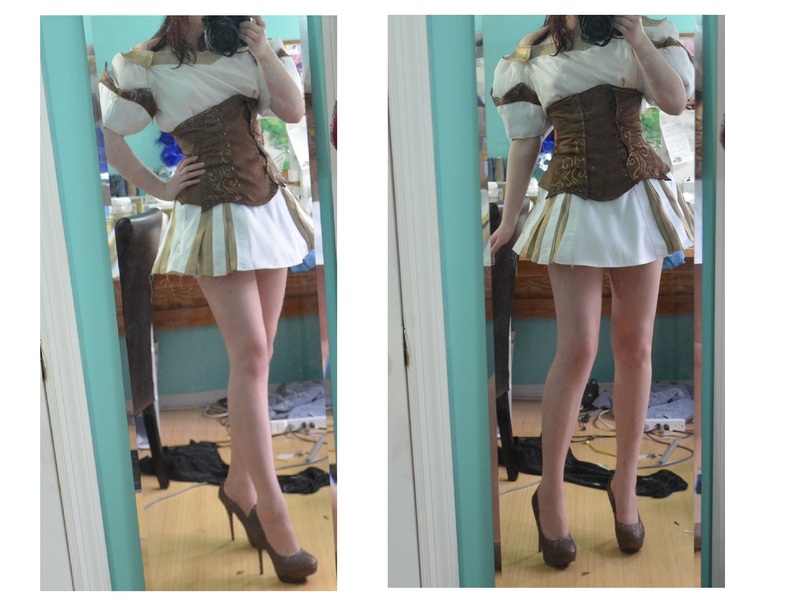 The skirt was probably the most challenging part of all. It has so many pieces and they all had to be sized and laid out just right. It was very tricky to get right! I made a mock up and drew on the designs. 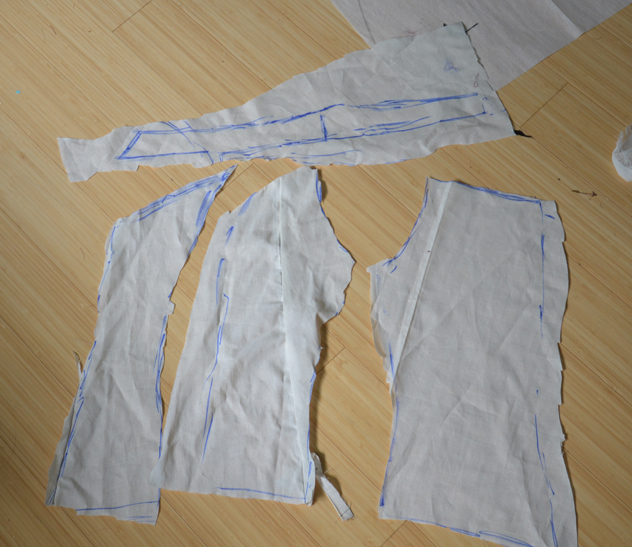 Then I transferred that onto proper paper and added room for seams, the hem, and stuff like that. 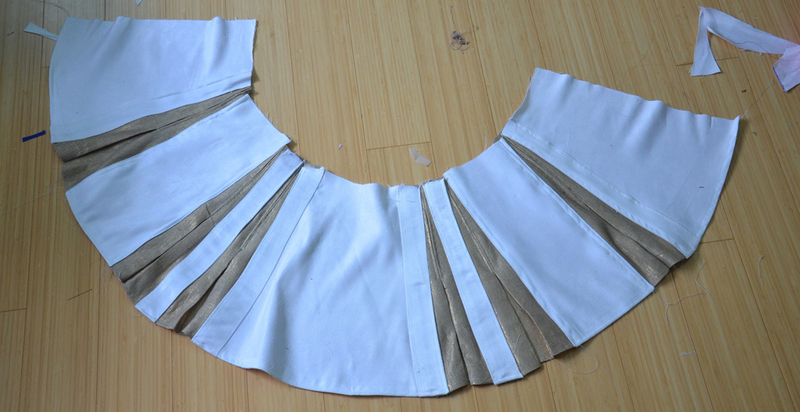 The skirt required six pleated bits, which were all made from the two way stretch knit. 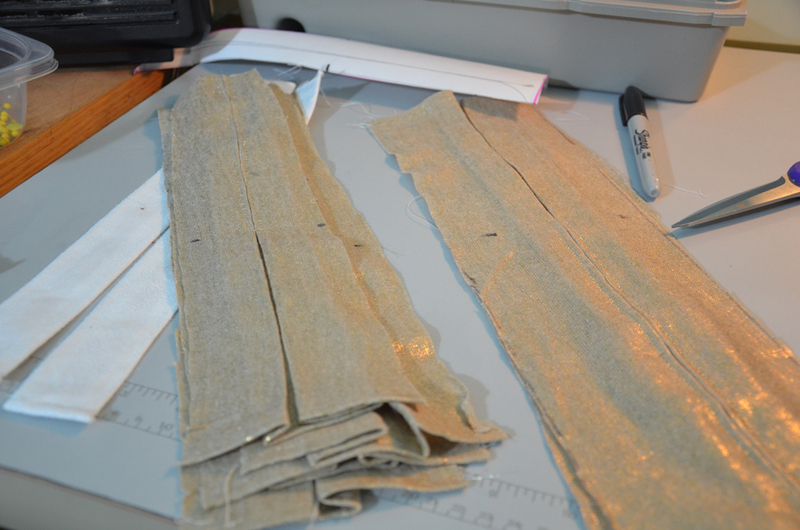 Not the easiest fabric to pleat properly! everything else was made from heavyweight fake suede. The skirt was very short and didn’t stay up right. 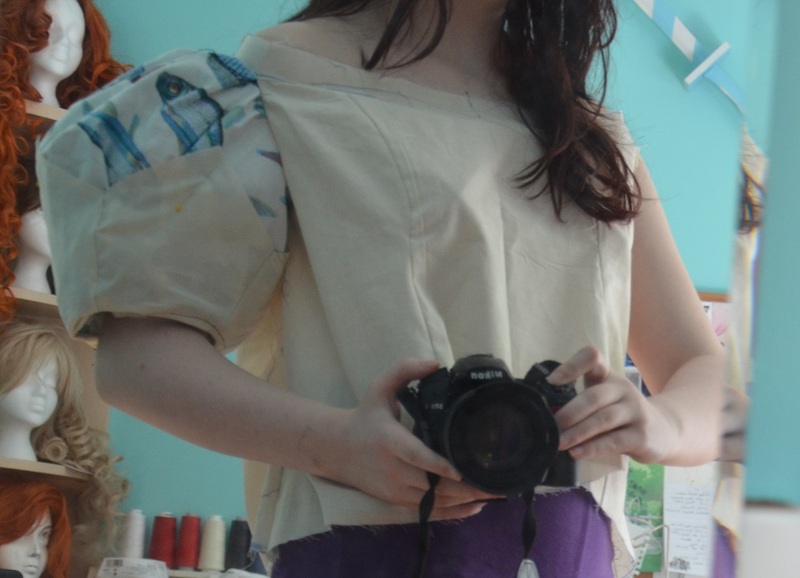 Luckily I fixed both of these things quite easily, the skirt got a waistband (which closes with snaps – but is pinned in these photos), and an underskirt which added 2 inches of length. 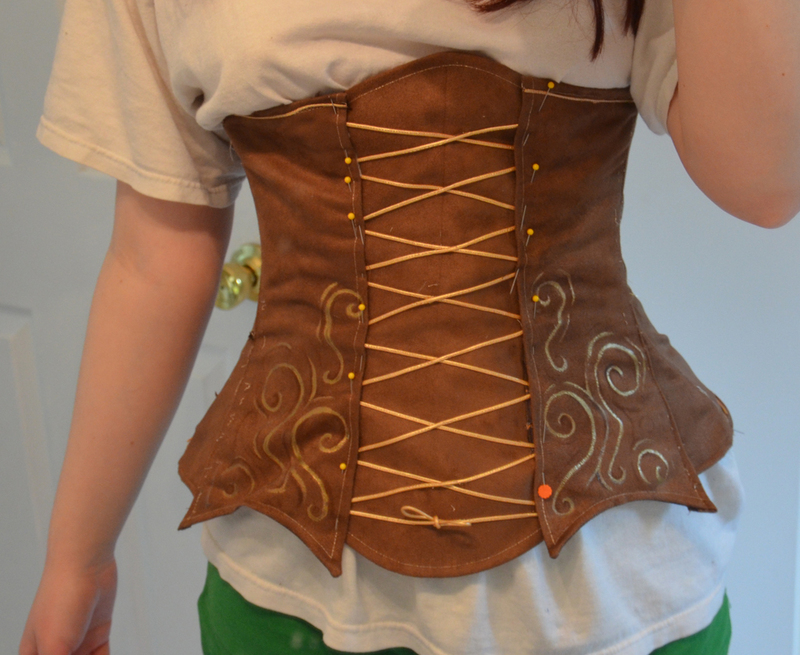 Then I resumed work on my corset. 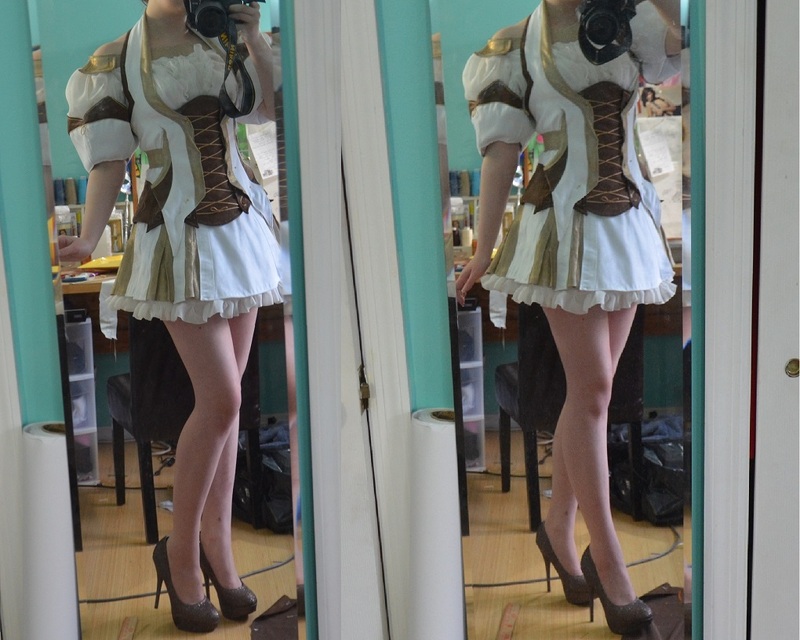 I ended up sewing down the laces, which seemed really silly but looked good. 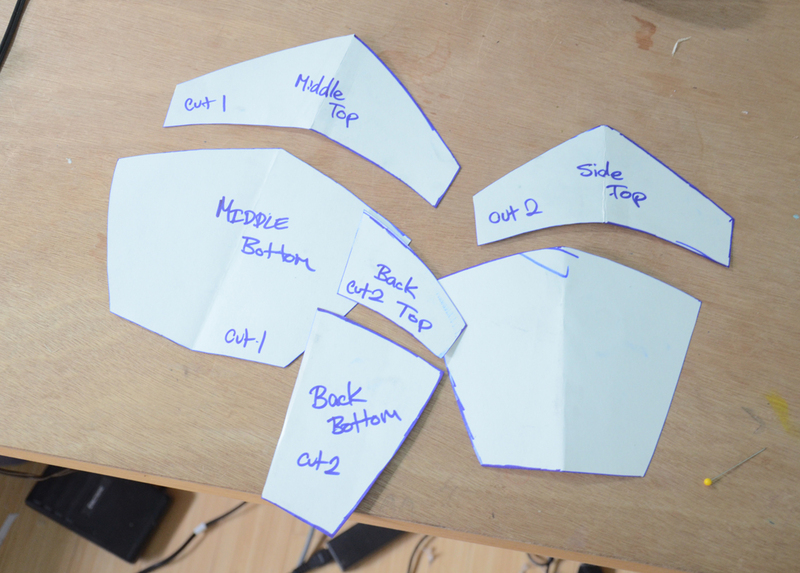 I sewed up one side of the front and adding 14 snaps to the other side, which keeps it closed. With that finished (or just about) I moved onto the vest. I draped this on my dress form and it looked very silly. Luckily it looked a lot less silly once made from proper materials! 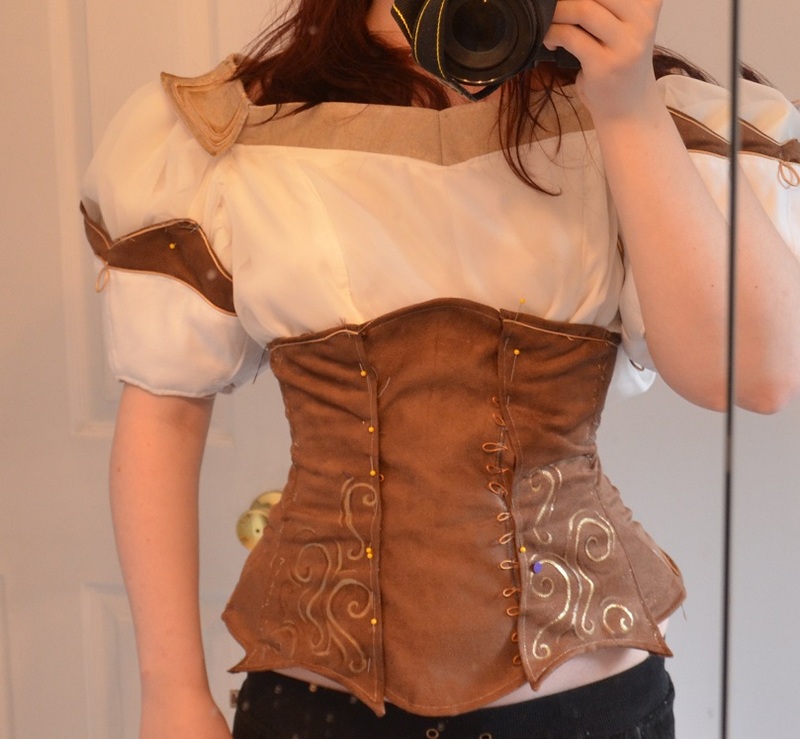 And put all together, just missing trim, buttons, and topstitching. Once worn all together it looked like so! 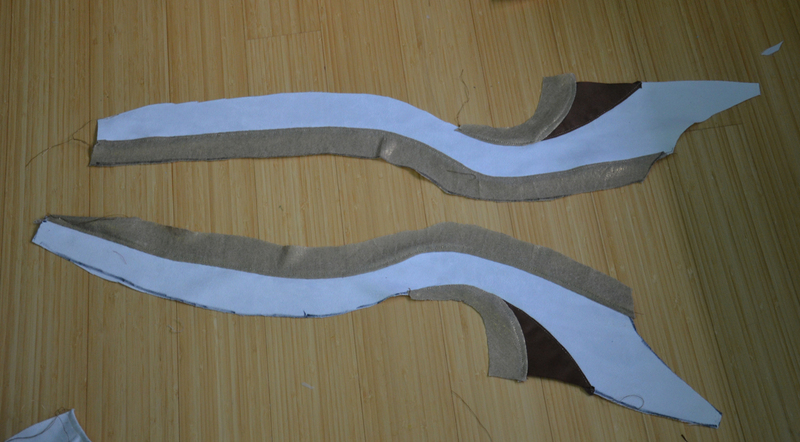 Sadly I do not have photos detailing the making of the collar and socks, but those were pretty simple. I also added buttons, and then it was done! 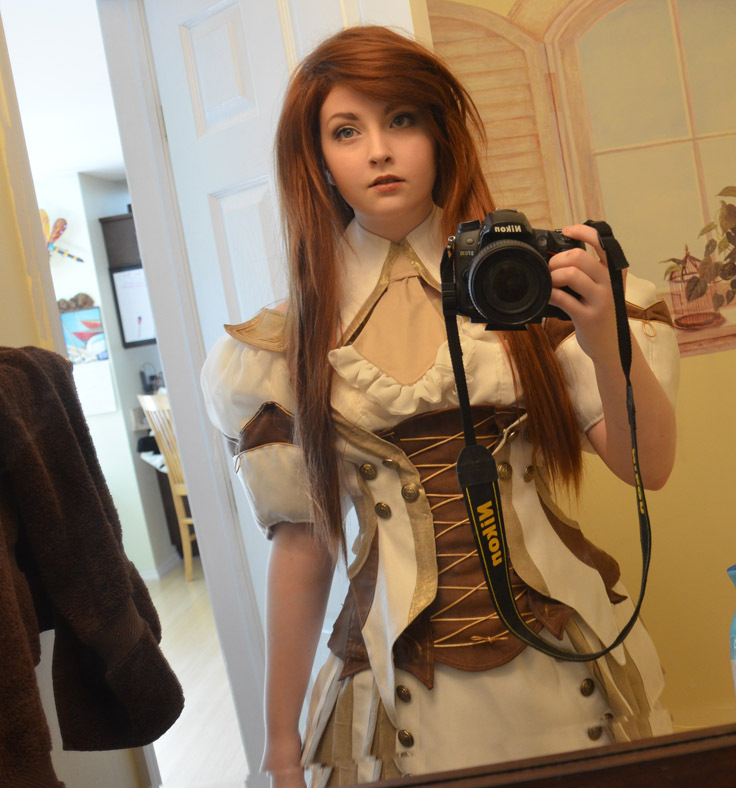 Full body photos will be posted soon. Thanks for reading! You are an absolute inspiration! I’m seventeen and have wanted to learn how to sew for a while now. I pretty much only know basic stitching. But! My grandmother agreed to teach me if I buy the sewing machine she thinks is best to get, so I’ve been working on saving up the money. (= I’m posting on here because I would really love your opinion if you could. How hard would it be to make these? I’m not sure if you’re a fan of The Mortal Instruments, but that’s the waredrobe I’m aiming to display sometime in the future (= I know I can’t make this first time sewing with a machine, but it’s like one of those future goals ya know? =D I just want to know if it’s possible to make instead of paying such high price to buy if I can make something hey close to it. I love drawing as well! And writing, and reading. xD I just recently starting drawing again since I gave up about four years ago since I thought I sucked compared to my friend. But honestly, it’s something I love and aim to improve in. I’m all into art and music xD haha. I would be so very grateful if you replied when you have the chance! ^_^ Thank you so much for being who you are =D it’s honestly made me determined and optimistic that I can accomplish something such as using a sewing machine ha. No worries – Thank you very much i’m glad you like the costume! If you are really attached to that specific dress, I would probably just buy it. But you can search for black lace material and try to make something similar if you just like the style, etsy is always a good place to find lace fabric. As for the jacket, that’s something quite difficult indeed. It’s got quilting and jacket zippers and studs and pockets, not to mention it’s all leather! None of those things are fun on their own, much less combined into a single project. The hardware and material (nice leather) would cost you the upwards of $100 I’d think, so paying $170 is probably a good deal. If you have a lot of patience and are really committed to a single project you might be able to manage it – but I wouldn’t suggest it! Haha yes i’m very familiar with future goals. I hope to accomplish a few this year too! Congratulations for getting back into it, I’m sort of that way with writing – I really enjoy it but my former best friend, mother, and brother are all excellent writers and it’s hard not to compare yourself to the people around you. But if you love it you should do it, you’ll never improe if you don’t try! Goodluck with saving the money and your future porjects! Thank you so much for replying so fast! I’ve decided I’ll make the dress (or check out Ross) and already went ahead with buying a similar leather jacket since that one is out of stock. I took a look at the fabric store here and there wasn’t any pleather fabric I would think of using for the jacket so it made sense to buy a jacket similar. That is very true. You are always your worst critic. And exactly what I was thinking! You never know!